TSH offers both home and portable oxygen concentrators (POC) for rent as well as other respiratory products include CPAP / BiPAP Machines. If you are in need for a Home Oxygen concentrator or a Portable Oxygen concentrator, contact us today. Travelers or those having short term recovery needs find our rental products easy to use and of the most modern type! Our rental process is simple and easy. We can provide just one item or a complete solution to fit your needs. 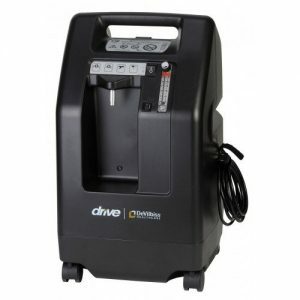 TSH’s supplies the latest in home oxygen concentrator technology for rental. They are lightweight, quiet and easy to move around since they are on wheels. Cannula’s, tubing and bubble humidifiers are available for purchase to complete your rental. Pick-up in-store or have it delivered to you! Our oxygen concentrators range from 0-5 LPM. Portable oxygen concentrators can be extremely useful expecially when you plan to go on a trip, spend a day in town or travel . 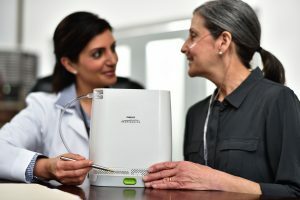 TSH carries the latest technology of oxygen concentrators with an attractive and slick design and an easy. 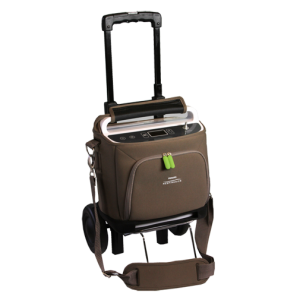 The SimplyGo Portable Oxygen Concentrator is the most advanced POC on the market. Combining state of the art, rugged construction with the most efficient and powerful oxygen concentration ever produced for portable oxygen therapy. The compact size and sub-10 pound weight makes the SimplyGo perfect POC for travel on an airplane, cruise, road trip, or train. Give us a call or stop by at our store to pick up your rental today. If you prefer to purchase rather than rent, contact us directly at 713-669-0500 for purchase options – we’ll be glad to help!